The rapid growth of Hotel industry in the last decade has led to much expansion of the industry, and many hotels seem to mushroom out from different corners of the world. Tourism industry which complements the Hotel Industry is also developing rapidly, and by far every nation is up and about with projecting their states as the tourist destination to drive more tourists to the land. The income that the state incurs from the tourism industry is a plus point that leads to nation upholding their area as a tourist spot. The changing multicultural environment effectuates leaps and bounds growth of Hospitality Sector where recreation has become one of the biggest stress-buster for the people today. Spending good times with family and friends as well as exploring various tourist spots across the globe is a common interest that many shares. The hotel industry needs to stay in sync with the demands of the hospitality sector and constantly upgrades new services for the clients. Hotels can be classified by service they provide. The more quality is provided in the service; the more stars are associated with the hotels. The price range also greatly varies in keeping with the premium services available in the hotel. The best thing about the industry is no matter where you go you can find an array of hotels that comes in varying price ranges that will suit your taste and pocket. But what is the importance of Hotel Industry? Apart from the fact that it generates a lot of revenue for the private owners the need of Hotel Industry is much for the general mass and the nation at large. Any tourism spot will be flocked by hotels that will compete with their distinct offers, price ranges, and services. The need of the Hotel Industry is much holistic than you would believe as other than adding on to the GDP of the nation this Hotel Industry provides an excellent job base for many in the country. Imagine the entire workforce behind a Hotel industry working to give you the perfect service. They entire labor force finds recruitment and livelihood through the Hotel industry. Moreover, many specialized professions like chefs, Housekeeping staff and other thrive within the Hotel industry. A loss of the Industry will mean the extinction of many of these professions. The tourists that come to visit Hotels want to be pampered. The service provided by the Hotel gives the customers a little break from their daily life where they need not take care of themselves and has a gamut of professionals working in the hotel taking care of their needs. The luxury services on offer in the hotel like spa, gym, restaurants and swimming pool is meant for the entire family and smiling housekeeping staff ensures that the client has a right time. Maximum comfort at the most affordable rate is. Therefore, the norm of the day in many hotels and more services are being added to lure in the customers constantly. Hotels are much needed for business travelers, and many Hotels have tie-ups with big enterprises offering them rooms and their services as a packaged deals. Many business meets and exhibitions happen inside the hotel as hotels often can provide with enough space for the gathering of a large crowd. For every business, it is not possible to find accommodation for all their employees who must be traveling from different branches to another city for a day’s meeting. 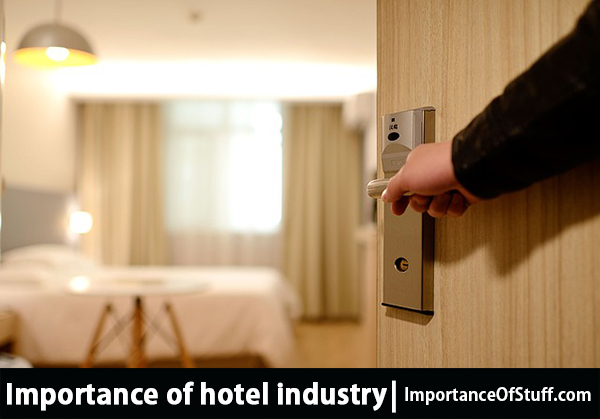 The tie-ups between hotels and business houses, therefore, help profusely as the employee who has come for a day for a meeting can station himself or herself in the hotel room. The hotel industries come with many other byproduct Industries that can be seen coming up all around it or even within its premises. The spa room, the gym area and the little souvenir shop in the lobby are all by-product industries of Hotel industry. The media as an industry also gets much business from the Hotel Industry as the hotels are consistently publishing advertisements about their services in different mediums. The creative strategy employed by the hotels to drive in customers also need great interior decoration and marketing technique, and these are two lines of business that also thrives side by side with the Hotel industry.